When we decided to relocate back to New York, I reluctantly allowed my son to play spring football in the local league that he played in for two seasons. After watching the favoritism shown to the teams whose coaches are in the “inner circle” of this league, we searched out a better option and played someplace else this past fall. Unfortunately, that league doesn’t offer spring football, and I didn’t want him to miss out on playing because of the issues that I had with ridiculous politics. I spoke to a coach that I knew from our last season in the league about getting my son on his team and becoming an assistant coach. Everything was on track to make it happen, until my son excelled in tryouts and was selected in the draft by another coach earlier than anticipated. The team that I tried to get him on is the dominant team in the league, but that was not important to me. I just wanted my son to play for a coach that I respected as a person. We have always been on winning teams, but the experience wasn’t always good, especially when the coach cared more about winning than developing the kids as football players. I am very competitive, but to me, competing hard is more important than holding up the bigger trophy at the end of the season. This afternoon, we faced off against the team that my son almost played for. As the last two undefeated teams in the league, this game was highly anticipated, but fell far short of expectations. Our opponents dominated our team on the scoreboard the way that they have dominated every other team that they have faced. It wasn’t a total shock given our opponent’s superior talent and experience playing together..
No one likes to lose by a large margin, but at this age, the scoreboard is not necessarily a true indicator of how the teams competed. For the most part, we kept them in check, but 4 big plays made it look like they were moving the ball at will against us. Since they have done the same thing to every other team, we knew that this outcome was a possibility. In all honesty, we didn’t have what it takes to beat them today, and probably wouldn’t if we faced them again in the playoffs. Even though they are the best team in the league, and will likely go undefeated again, after today, I am very happy that my son did not end up on that team. Although the majority of their players play the game the way that it is supposed to be played, some of their players think nothing of giving cheap shots and trash talking. Personally, if it were kids on my team doing that, I would bench them, but that’s just my coaching style. One player in particular gave a number of cheap shots to our players. This kid had already been investigated for his actions against an earlier opponent, but of course, he was cleared of any wrongdoing. I can’t say for sure why he was able to get away with it in our game, but suffice it to say that the referees missed some very blatant unsportsmanlike conduct penalties. Although there is no rule that says that you have to stop trying to score once the game has clearly been decided, many coaches use that portion of the game to give other kids the ball besides the running backs. The fact that the opposing coach continued to give the ball to his star players long after the outcome was already decided goes to show that our coaching styles are simply not compatible. And though my son may end up on a team that runs up the score one day, I would prefer that he doesn’t adopt that mindset at such a young age. Unless there is a shocking upset, the dominant team will celebrate another championship at season’s end. It is a moment that I am sure that they will revel in. Would my son like to win a championship? Absolutely! But it is not as important as becoming the best football player and person that he can be. Years from now, none of this will matter at all. Only a handful of these kids will continue to play football once they graduate high school. Most will not. And the odds are that none will make it to the NFL. 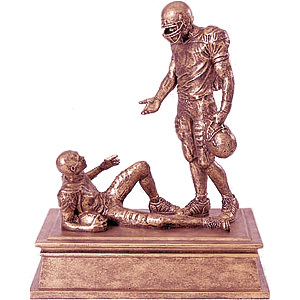 Given the choice between having my son play for coaches who teach kids to play hard with good sportsmanship or one who uses his superior talent to continue to pile on once the game has been decided, I will choose the former any day of the week, even if it means not winning a championship. I never won a championship in all of my years of organized sports, but I look back on my playing days with an incredible fondness because of the coach that I had the privilege to play for. When my son’s bruises heal from the cheap shots that he received today, he will forget about this loss. Eventually, what he will remember most about his last season of football in Texas is the tremendous experience that he had playing for outstanding coaches. And in the end, he will be better off for not getting drafted by the dominant team in the league!